“Travelling in a car is like watching a movie. Riding a bike is like starring in it.” – Anonymous. Riding is not just about having new experiences. It is not even about passion. It is not to display rebellion, nor is it about freedom. Riding is not about indulging a sense of wonder, or finding a destined path. Riding is all that, and so much more. It is about the mind being able to control the machine. The power to charge through bends and bumps in life, while still being in charge. Riding is about opening up to the unseen, and merging with the unknown. Riding is not a way of life. It is, life. Our journey as riders started many years back. As engineers, we always understood machines; what we didn’t fully grasp was the enormity and beauty of life. We took our love for biking, and our design capabilities, and hit the road! We rode across India and met fellow bikers to seek inspiration. We were clear that to make riders’ life easier, safer and more comfortable, there was a need for us to innovate. 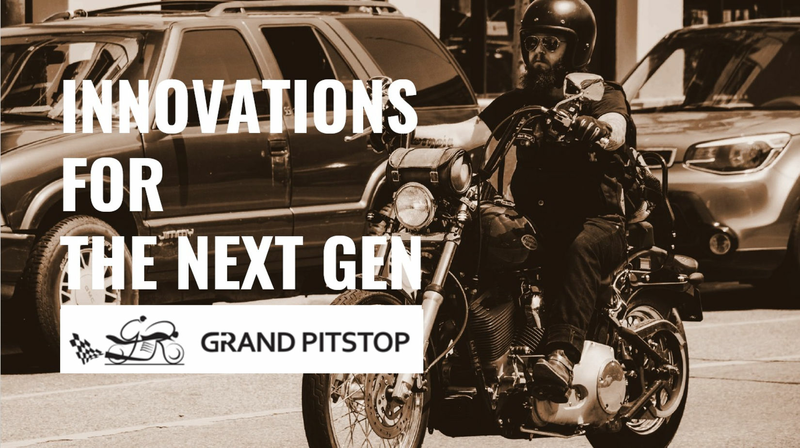 GrandPitstop was born from that desire for innovation. The spirit to create something that would keep bikers safe and bikes running better. There are four things that we do – Research, Design Innovation, Use High-End Technology and Manufacture products that we need as bikers, but couldn’t find in the market. Over 2000km, endless cups of tea, amazing dhaba food, state tolls and sore backs later, when we returned to our innovation lab in Dwarka – we were armed with insights from bikers who we met on the road, or went to their garages and learnt what they needed. Research for us is the foundation on what GrandPitstop operates – we find out what the community needs, and then design solutions to deliver products that make a difference. Great design is about making something super complex, very simple. Each of our products is designed by engineers from leading institutions in India, and the pre-requisite is that they must be riders. So imagine a design team that knows exactly what riders want, and then test the product a thousand times over to ensure that it lives up to the promise. Some are limited by technology, others go out and innovate. At GrandPitstop we bring in the best technology that is available in the market, and what’s not available, we innovate to create solutions – so that we are never limited by the possible. We have over 9 patents to our credit, and are constantly adding more. Our technology wing in the innovation lab is full of CNC machines, 3D printers, scanners, polymers and test dummies. It is a little paradise of engineers. Controlling quality, cost and efficiency are of paramount importance to us. Our marquee productions are all manufactured in-house at the GrandPitstop manufacturing section within the innovation lab. Each product goes through hundreds of checks, tested for efficiency and robustness under acute conditions. We are a ONE STOP SOLUTION for ALL YOUR BIKING NEEDS! !